Part of Terminator 2’s lasting appreciation and success is in its subversion. It’s a killer-robot-from-the-future movie, slapped with the title of a direct-to-video exploitation flick. The synth score should breathe a sense of cheese into the happenings. There’s a robot made out of liquid. It’s senselessly violent. 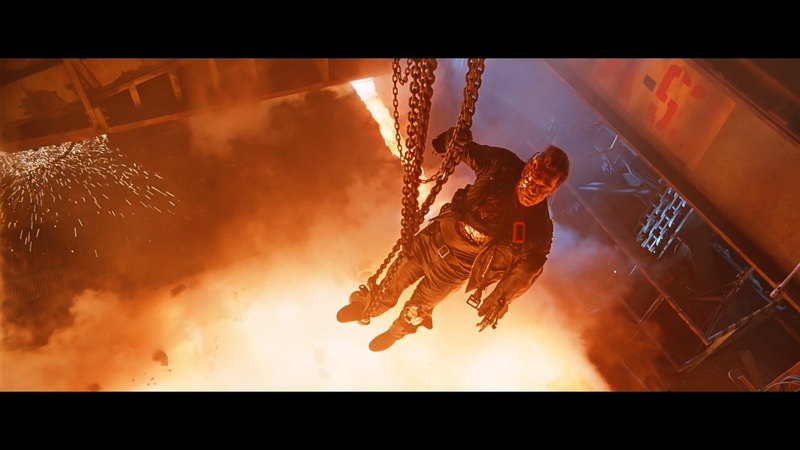 Terminator 2 follows a different barometer for success, an intelligent morality story, a family road trip saga with a bevy of bullets and at times, and still unmatched action scene design. 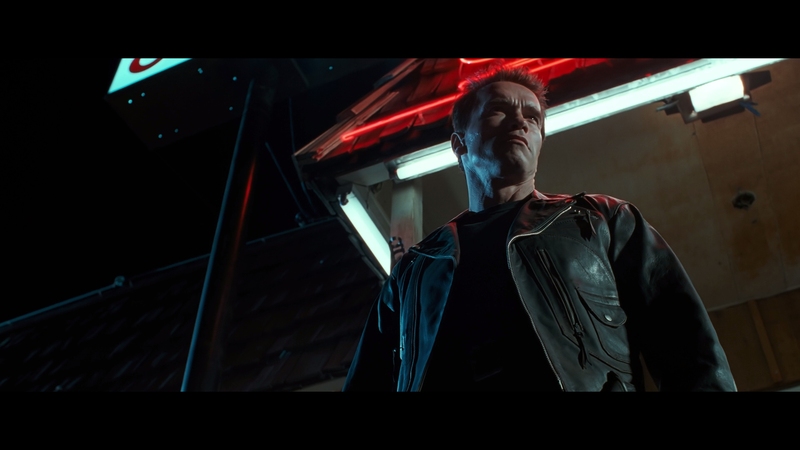 Terminator 2 loves the kinetic and the loud as often as it loves the slow burn of dialog. The balance of the two in this genre is unusual, yet critical, even masterful. This isn’t about Arnold Schwarzenegger toting shotguns and putting holes in things. 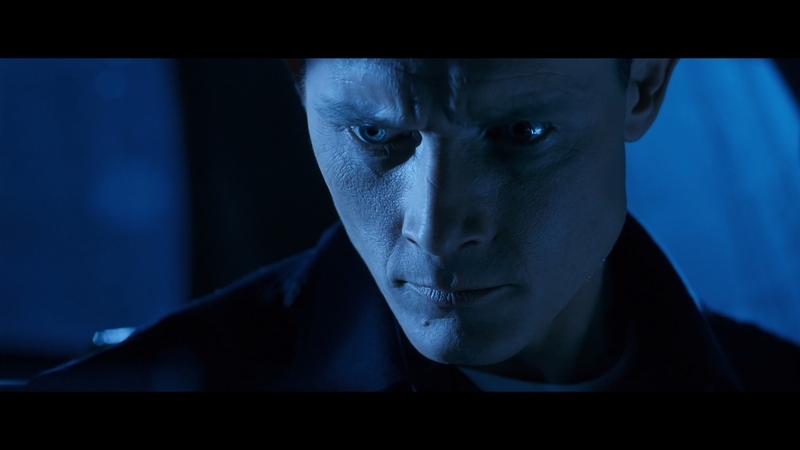 That’s here, but Terminator 2 concerns John Connor (Edward Furlong). He’s the lost kid, parent-less, stuck in uncaring foster homes. Connor rebels. He wears Public Enemy t-shirts and his boombox never leaves his side, the volume never less than maximum. Rather than keep him barrelling down that life path – and when Connor realizes he has his own killer robot, he could – Connor’s desperation for grounding unfurls. Connor takes solace in afather figure, even if said figure once came back through time to kill Connor’s mother. That longing, that inherent need to have an outlet; that’s Terminator 2. 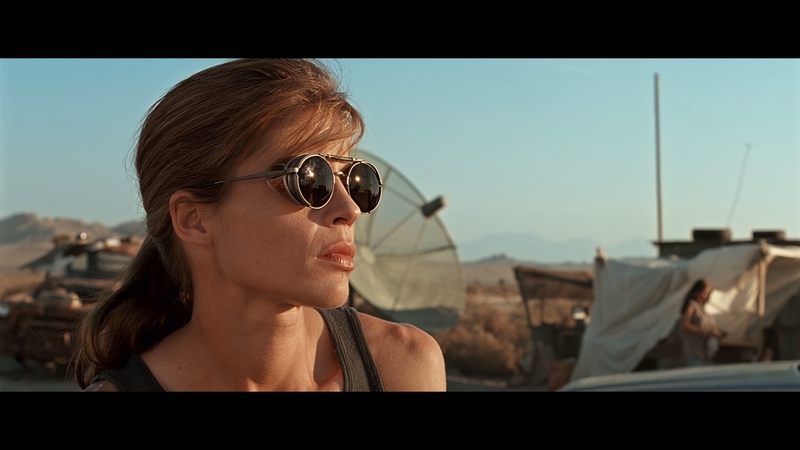 For Sarah Connor (Linda Hamilton), she’s tough. Hamilton’s muscled physique and hardened exterior make for great action cinema, but better still character development. Every mother thinks their kid is the most important in the world. In Sarah’s case, that’s abundantly true. She can sling grenades as well as Arnold, but also needs an emotional core of everymom. The script gives her such. Terminator 2 has heart. That’s simple and corny, but true. 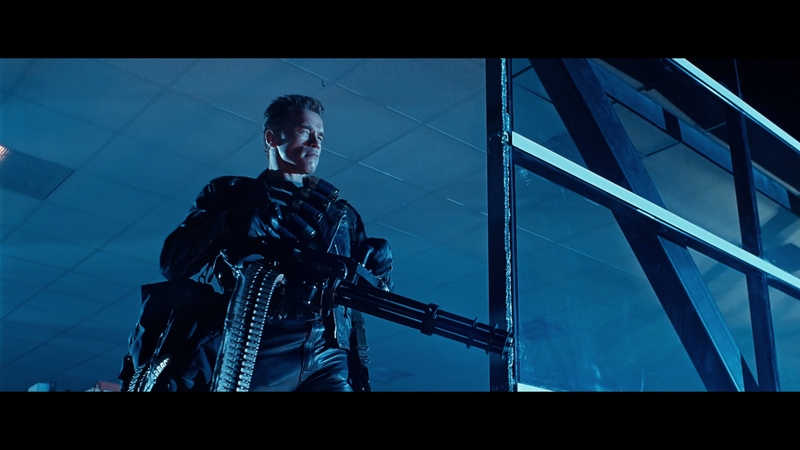 The trio – the Connors and Arnie’s T-1000 – all learn from one another how to be human. The hero robot is taught morality. John learns the impact of his behavior. Sarah, she learns her fate isn’t pre-determined. 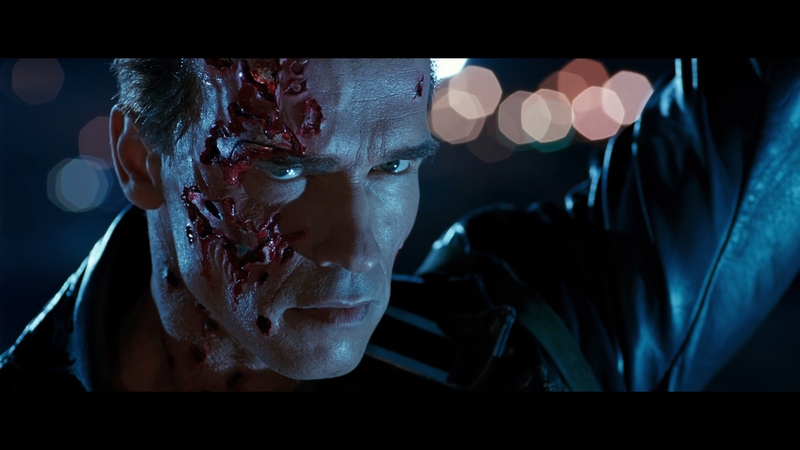 All of this and Terminator 2 still set a standard for visual effects. Groundbreaking fits Terminator 2. 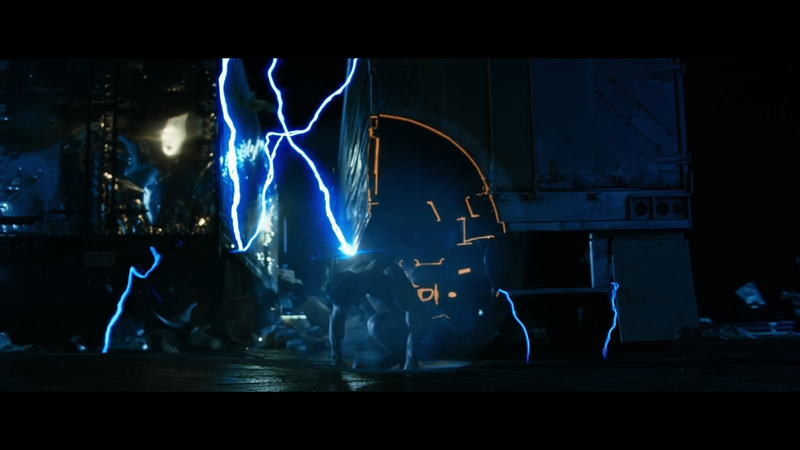 A slew of computer generated, reflective ooze, sensational practically created images, plus the pyrotechnics combine for a never listless sci-fi action feature. None of this overpowers story though. That’s another subversive element. Action movies love action. 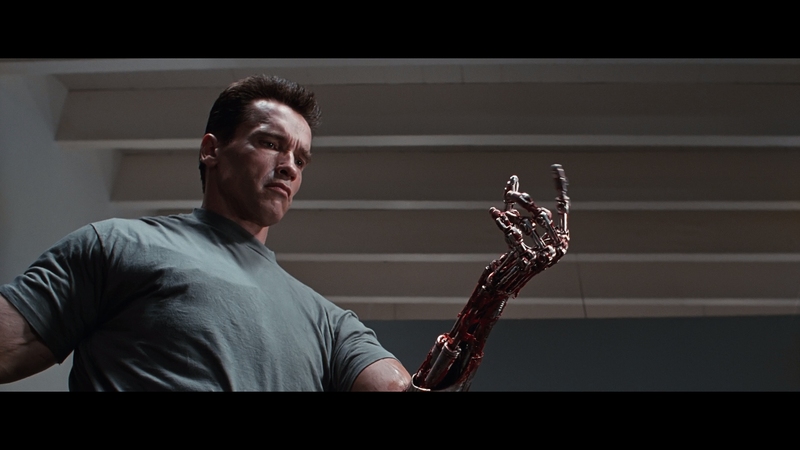 Terminator 2 does as well, but won’t let go of its human characters in exchange for future robots. 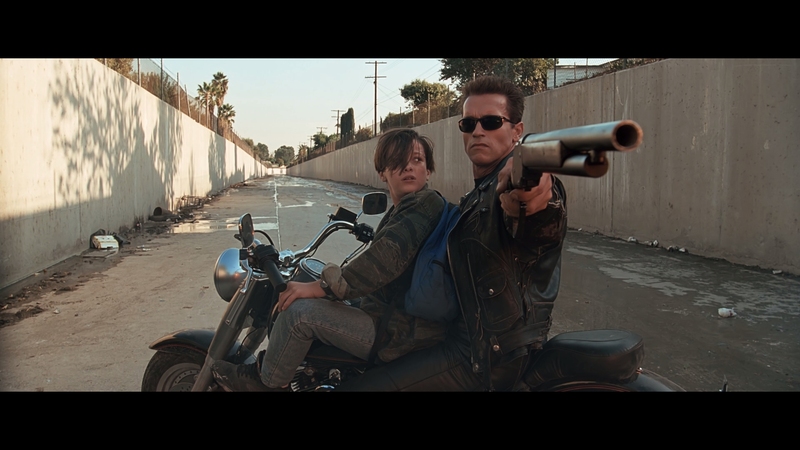 You’ll need a flow chart to understand which of Terminator 2’s home video releases is best. Wherever you land though, it won’t be this UHD. This fudged transfer follows a 3D conversion for theaters (not included in this package) that sucked the grain from Terminator 2. What’s left is a high-resolution master, if ultimately a pointless one. Moments of grain still exist in this transfer. A quick turn of the head or a stray background element still shows a glimpse of what was. The rest exhibits an unnaturally glossy, clean look, utterly improper for something captured on film. Box art touts a new digital transfer. That’s true, but far, far too digital. This isn’t the worst application of noise reduction ever seen. Universal’s disasters like Tremors’ Blu-ray this is not. At times, the benefits of a 4K source do show. 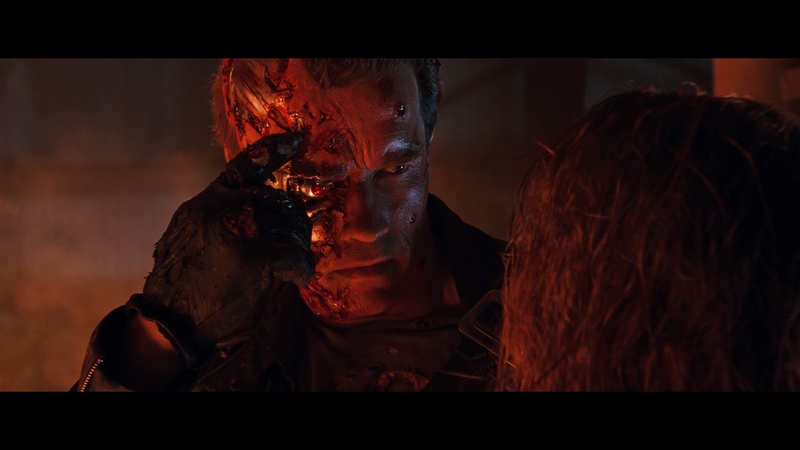 Close-ups do reveal additional fidelity over the previous Blu-ray editions of Terminator 2. Medium shots, where people display an inhumanly waxy look – those ruin this disc. Insofar as HDR effects go, expect little. Other than the molten metal at the end, any additional brightness is minimal. 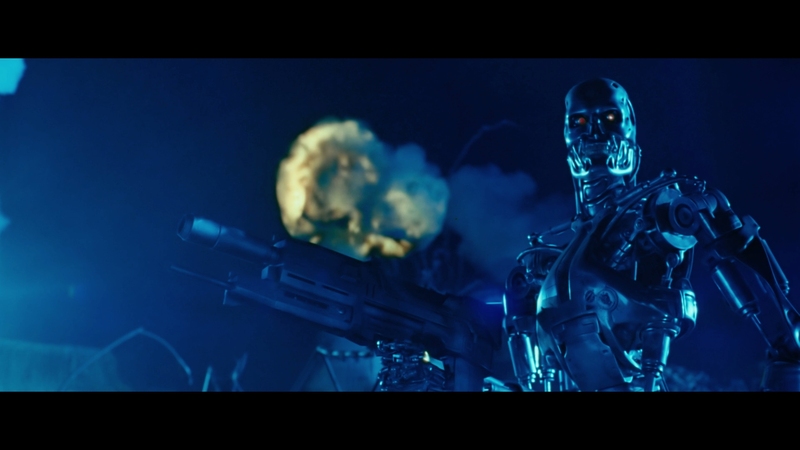 For HDR-enabled UHDs, Terminator 2 looks downright flat. At least black levels show, beneficial here for the ability to resolve details on Schwarzenegger’s black leather jacket, even at night. 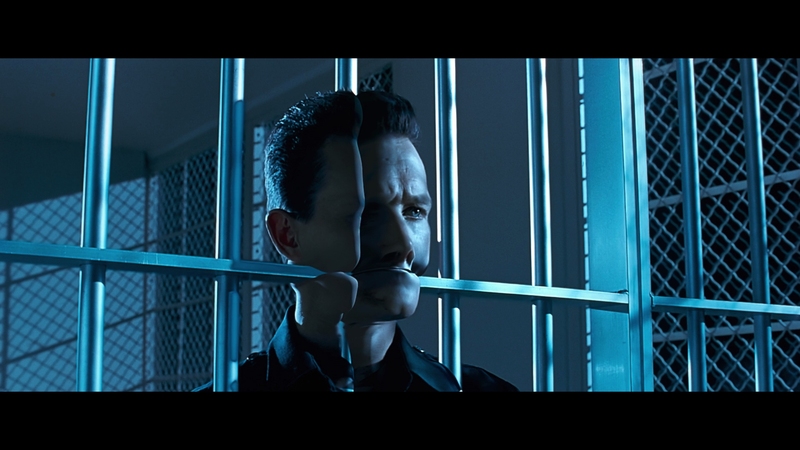 Denser blues frequent much of the film, the typical filtered color Terminator 2 featured with every release. The additional saturation does look digitally graded. With a modern restoration, that’s no surprise. Yes, that is a meager DTS-HD 5.1 mix on this disc. If you speak German, that additional language track goes up to 7.1 for reasons unknown. 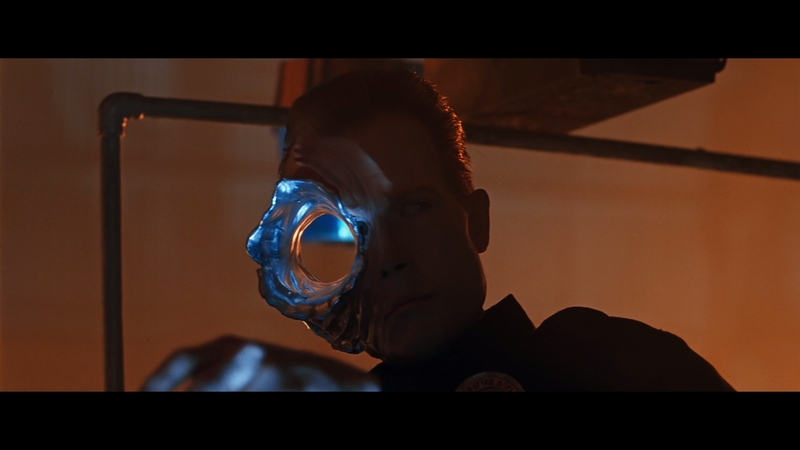 Once a showcase, years took a bit of stock from Terminator 2. While this mix offers range, it’s a mix of extremes. One note explosions have kick, while anything other than shotgun blasts lack any impact. A nuclear blast generates awesome rumble, if no better than any other fireball. Even with the now restrictive soundstage, surround and stereo use figures prominently. Action breaks from the center, with fine debris fields and bullet tracking. Voices stretch the fronts, and the synth score fills each speaker. Fidelity reaches a fine peak. It’s fine, but it’s time for a generational remix. Nothing new here. Note the alternate cuts of Terminator 2 only exist on the Blu-ray; the UHD is the theatrical edition alone. Two commentaries, one way too crowded with 23 people from the crew, and another with James Cameron and writer William Wisher come on the Blu-ray. The UHD is snubbed. 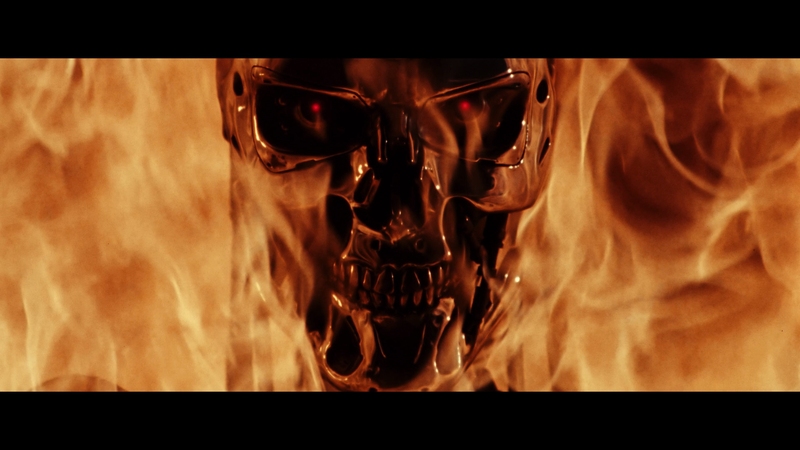 The 54-minute Reimagining the Terminator remains an excellent doc on the production if you haven’t seen it. A documentary from 1993 doesn’t hold much value anymore and two deleted scenes (even with their optional commentaries) are flat. Over 25 years later, Terminator 2’s subversive mixture of bloody action and family drama keeps this film a genre classic. The 15 unaltered images below represent the Blu-ray. For an additional 24 Terminator 2 screenshots, early access to all screens (plus the 9,000+ already in our library), exclusive UHD reviews, and more, support us on Patreon.